The European Parliament has rejected ACTA, a controversial trade agreement, which was widely criticized over its likely assault on internet freedoms. Supporters of the treaty suggested postponing the crucial voting at the Parliament plenary on Wednesday, but members of the parliament decided not to delay the decision any further. 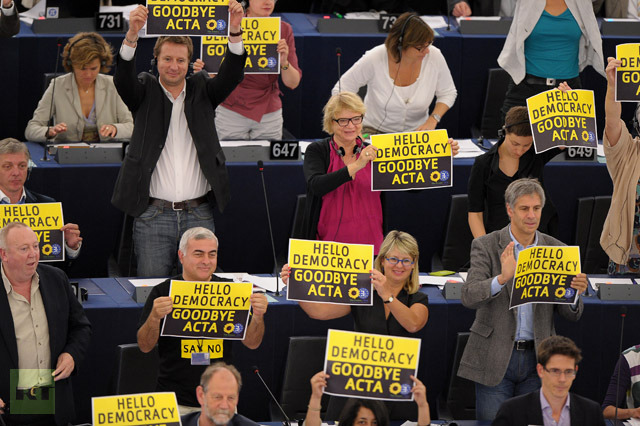 MEPs voted overwhelmingly against ACTA, with 478 votes against and only 39 in favor of it. There were 146 abstentions. 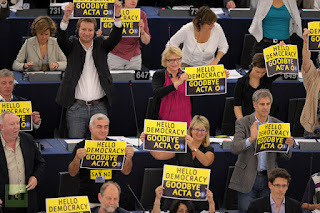 Many members of parliament held anti-ACTA banners or wore anti-ACTA T-shirts during the session. Earlier all five parliament committees reviewing ACTA voted in favor of rejecting the international treaty. The Anti-Counterfeiting Trade Agreement is aimed at protecting copyright over a wide range of industries. The main focus of criticism was targeting the impact it would cause to internet freedom. ACTA would require signatory states to impose draconian restrictions on online privacy in the drive to eradicate content piracy and the sale of counterfeit branded goods through the internet. ACTA was developed with the participation of a number of countries, including the US, Japan, European counties, Australia, South Korea and others since 2007. When the ramifications of the agreement came to wider public knowledge this year, a wave of protests hit several countries. The EU suspended the ratification of ACTA in February to reconsider it.